Sinuously fluid prose? I don’t think so. And please, don’t imply it’s better than Rosemary’s Baby. Ira Levin writes with sinuously fluid prose. Fred Mustard Stewart does not. And any suspense is killed at the end of the first act when the author flat out tells the reader the whole business is about the aforementioned transmigration of the soul right down to the Satanic “ritual”. The rest of the book follows the heroine trying to catch up. Stewart also has little skill in the character department. Miles and Paula Clarkson are about as bland as they come, presenting nothing with which the reader can relate. Oh yeah, my husband is involved with a group of Satanists – I can relate to that. Journalist Miles scores an interview with the aging concert pianist, Duncan Ely who immediately takes a fatherly interest in Miles’ own failed career on the concert circus. Next thing you know, Duncan and his lover…ahem, I mean daughter… whip out a bottle of Satanic oil and start mumbo jumboing in Latin and, voila, Paula has a feeling her husband ain’t her husband any more. Stewart throws in the usual business: murdered ex-wives, dead babies, a black dog, the Old Religion reinvented as Satanism, and a mysterious Man in a Bowler Hat. Stewart scores a few points in the research department. He at least knows his stuff when it comes to the piano and piano music, describing the “sound” of the titular waltz. 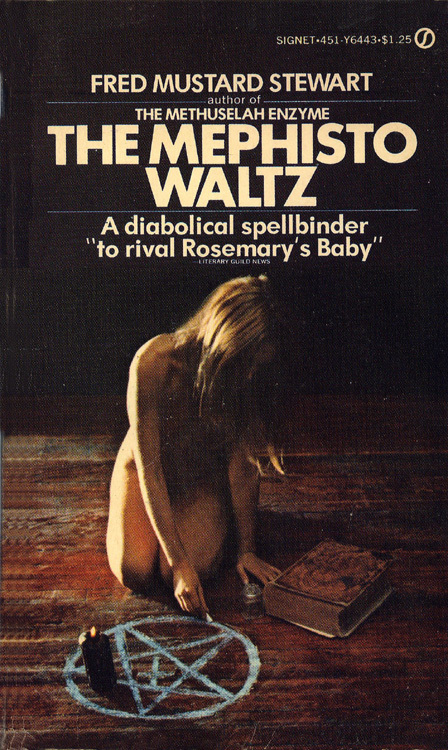 Late in the book, Paula browses Ely’s library of Satanic tomes and Stewart lists a catalog of essential titles in the Black Magic oeuvre, everything from Malleus Maleficarum to Discourse of the Subtill Practices of Devilles. 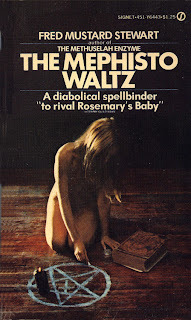 If you’re into this sort of Satanic silliness, The Mephisto Waltz can be a fun, two-night read, although it left this reviewer wanting much more. 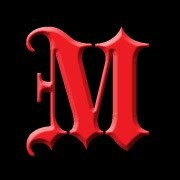 If you only ninety minutes or so to spare, check out the movie. It’s just as bad. No surprise at all... cover's cute though.